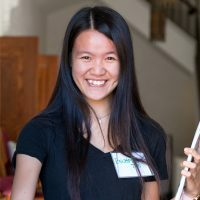 Beatrice Tan is a junior and participated in the Freshman small group during her first year at UW Madison. She shared this story at Sunday Worship on September 2nd, 2018. “Hi!” “What’s your name?” “Where are you from?” “Why did you come to Madison?” As we roll into the semester, I am sure that a lot of us have been asked these questions multiple of times. As funny as it sounds, these are actually some of the questions that I have struggled with the most? Malaysia, Taiwan, Hawaii—which one of these am I supposed to answer? I don’t know. To introduce myself here, my name is Beatrice and I am a Junior double majoring in Actuarial Science and Risk Management and Insurance. I was born in Malaysia, raised up in the beautiful island of Oahu, Hawaii, and moved back and forth since then. While it might seem obvious to some people, it has been pretty difficult for most people to understand my family origin and background. However, although my life has been in a constant move, spending most of my lifetime adapting and blending into the different cultural norms and environments, there is one place that remained perpetual—church. Coming into college, I knew that I wanted to be a part of a faith community that would allow me to grow personally and spiritually. I remember flipping through all the brochures I was handed to while walking along East Campus Mall, and scrolling through all the emails that have been sent to me. I am glad that Pres House was still in my pile of brochures on my desk, and that it was not thrown out in the trash just yet. As I gathered my courage and walked into Pres House, I knew that this was the place for me. The amount of generous smiles and friendly handshakes I received as I stepped into the hall warmed my heart. Not long after, I was invited by Erica to join the Freshman Small Group and I can say that it was probably one of the best decisions I have made coming into college! I have met some of my best friends in college, and I was able to share my thoughts and opinions in a safe and inclusive community. Especially after such a long and hectic week, joining the Freshman Small Group was definitely one of the things I looked forward to the most as the week comes to an end. The stress that has been accumulated throughout the week was instantly carried away as our small group comes together as one. Lastly, I would definitely recommend everyone, whether it’s your first year in Madison, or if you have been around for a while, to check out the awesome small groups we have for every one of you. Whether it’d be the Freshman Small Group, Bake, Pray, Love, Prayer ^3, or the Young Professional Small Group, I am more than excited to invite you into our Pres House community. Last but not least, I am proud to say that Pres House has impacted me positively while I was in Madison and I am proud to call Pres House my, maybe 4th, home away from home. Why should you go on fall retreat???? !